What Can You Do in the Gamestar Mechanic Game Alley? You can play games in both the Quest and Game Alley. Because the Gamestar Mechanic Quest has only a limited selection, most users spend their time searching for games in Game Alley. But keep in mind that the Quest contains very good games that are worth replaying every once in a while. Left sidebar: The sidebar is where you can search for games. You can use the Search text box to search for specific games or users. Or you can click one of the buttons for accessing other sections of Game Alley, as well as explore channels containing interesting example games. 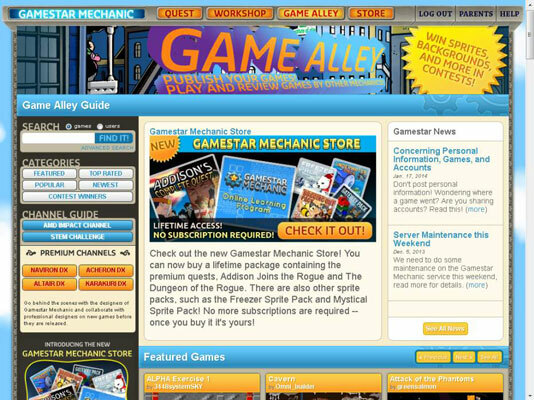 Gamestar Mechanic Store: This box provides news regarding the Gamestar Mechanic Store. Gamestar News: Here you can see news posts uploaded by the Gamestar team. The See All News button takes you to a page where you can browse all posts. Below the Game Alley Guide section, you find various sections containing lists of games. To ensure that everyone’s games can be noticed and played, Game Alley continually updates these sections to show you a different group of games each time. Featured Games: Games selected by the Gamestar team. These games stay on the front page until a new set of featured games is selected and used. Usually consisting of six to eight games, the Featured Games are placed in random order every time the page is loaded so that you see a different set of games each time you visit. Challenge Winners: For people who have won national contests on the Gamestar Mechanic platform. This section rarely changes, but it contains especially noteworthy games. Fresh Games: For games that have been available for a while but have received only a few plays. It encourages users to play games that may have been missed by the community. Up and Coming Games: Games that are going strong in the community, receiving good reviews within a short time after being released. Many interesting games are posted there every day. Games from Online Learning Program Students: A special section for games that were created in the Online Learning Program. Classic Games: For games that were published a long time ago (months or even years) and were well received. This section reintroduces games and allows players to discover old gems, or rediscover familiar ones. New Games: Freshly published, sometimes seconds before you found them. Whenever a game is first published, it makes the top of the New Games section. Top Rated Games: A selection of highly acclaimed games. Coming from a number of different periods, these games are often recorded as having perfect 5-star ratings, a feat that requires an average rating of at least 4 3/4 stars. Class-Specific Games: If you join a class, this section appears in your Game Alley. It works similarly to the New Games section, showing the latest games created by users in the same class. The name of the section is the same as the name of your class. Similarly, one of these sections appears in your Game Alley if you complete the Mentor Badge. You can scroll through all the games in a section of Game Alley by using the Previous and Next buttons.